Prime Minister Abiy Ahmed was feted like a superstar by his countrymen in Germany, whom he called on to return home and help build a new Ethiopia. Ethiopia's Prime Minister Abiy Ahmed just can't stay out of the headlines. After making peace with Eritrea he appointed a slim 20-person cabinet, with an unheard of fifty percent of posts going to women. A couple of days later, parliament elected Sahle-Work Zewde as the country's first female president. Abiy has embarked on a massive project of nation building which has earned him plaudits around the world. On Wednesday, a day after meeting with German Chancellor Angela Merkel as one of the 12 African leaders included in the "Compact with Africa" initiative, Abiy addressed tens of thousands of his countrymen and women in the German financial hub of Frankfurt. Throngs of jubilant Ethiopians greeted the politician whom some have taken to calling the African Obama. 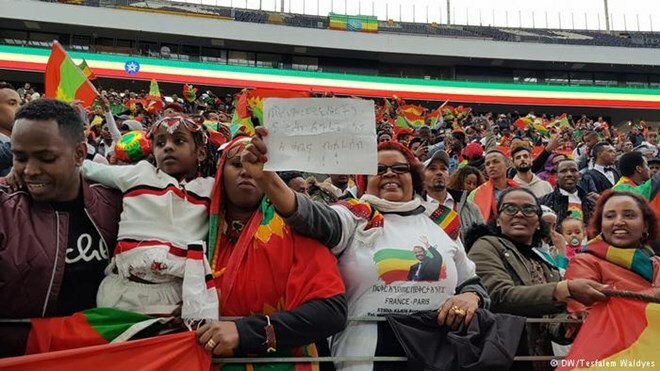 Ethiopians living in the diaspora travelled from as far as Turkey and Russia to listen to what Abiy had to say. Decked out with Ethiopian flags, singing and dancing, some of Abiy's supporters in Frankfurt told DW why they were there: "We have a very democratic leadership for the first time in the history of Ethiopia. All the Ethiopians who are supporting the reforms of the new government are here today," said one man, adding: "We are supporting the new prime minister because we need justice, freedom democracy and peace." Abiy himself wants something from Ethiopians living abroad. As he has said before, when speaking to the diaspora in countries like the US and France, the prime minister wants his countrymen and women not to just stay abroad "pointing the finger and criticizing" but to actively participate in building a new Ethiopia. "We have two things now: freedom and hope. With these two things and working in unison, nothing can keep us from building the Ethiopia we wish to have," Abiy said in Frankfurt. Abiy has said in the past that Ethiopia needs more than the already significant financial support it has received from its diaspora through remittances. It needs to reverse the brain drain that made it much poorer in past decades, it needs the professional skills developed by Ethiopians abroad and it needs to keep young people from leaving the country. Abiy has been hailed by the international community for his efforts to reform a rigid state and promote human rights and democracy. As one of his first acts in office, he released thousands of political prisoners and started reining in security forces. To many outsiders, it would seem Abiy can do nothing wrong. While acknowledging that the excitement around the Frankfurt event was very high among the prime minister's countrymen, Ludger Schadomsky, head of DW's Amharic Desk says there is growing criticism too: "More and more Ethiopians are beginning to see his popstar image critically at a time when many of his reforms back home are deadlocked and ethnic violence is threatening to undermine his nation building project." The liberalization brought about by Abiy had the effect of lifting the lid on historic conflicts over land, resources and local power, not to mention ethnic divides. 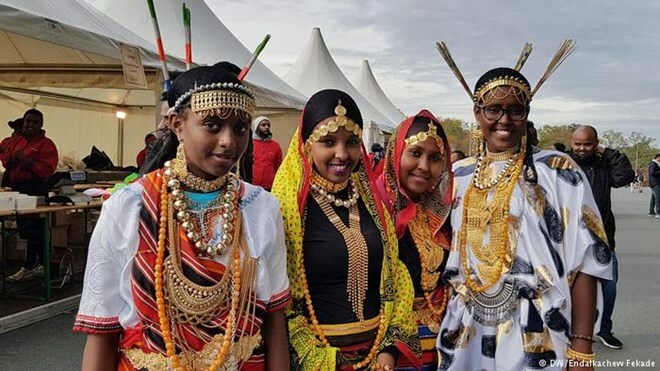 The Gedeo ethnic group complains that since Abiy took office last April, it has been subjected to increased violence by the Oromo majority. Critics say the prime minister, an Oromo himself, is avoiding tackling the subject out of fear of alienating his power basis. It is not that Abiy isn't trying hard, Schadomsky says. "He has done a great deal to try to bring Ethiopians from all walks of life and political affiliations together. Having said that, there is a danger that the more Ethiopians look toward Abiy as a kind of savior, the more bottlenecks will arise in the implementation process. He cannot shoulder all of Ethiopia's many problems alone. More authority must now be given to the regions and to state institutions." Abiyy Ahmed Oo Magacaabay Laba Wasiir Oo Halis Ku Noqon Kara Soomaalida. [Daawo:-] Madarasada Nuuradiin Oo Sagootiday Arday Ka Qalin Jabiyay Qur'aanka Kariim Ka Ah.